"The thing about Danny Boy is that he wasn't the type to get done in like this," said Danny Johnson's brother Willie, 22. He never got serious with people, you know. I was always prepared for someone else like Eddie to go," said Willie, point­ing at his brother Eddie. 23, a big man whose body has been pierced by six bullets and a knife. 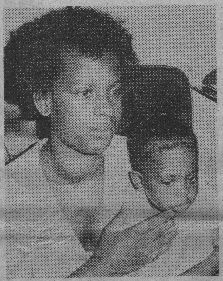 "MOMMA" JOHNSON CRIES IN A DAUGHTER'S ARMS, A SON AT ONE SIDE. "I thought it would be me, too," said Eddie. Danny's big family was gathered for Easter yesterday at Aunt Ola Walsh's house, 2023 S. Dearborn. No one both­ered to cook the food. Danny's mother Curtis Lee (Momma) Johnson, 44, sat on the couch, re­peating how a dying Danny said to her, "I love you, Momma." She furiously condemned someone "taking my baby away" and then she began swaying , and crying uncontrollably. The other women in the room cried, too. Momma Johnson reared her seven children alone, after a di­vorce 15 years ago, she scrubbed floors and ac­cepted public assistance. The police report said Danny E. Johnson, 17, an unemployed black male, was shot once in the lower chest with a sawed-off shotgun Satur­day at 6:35 p.m. in the first floor lobby of a low-income apartment building at 104-21st Ave. Attempts by aid crews to keep him alive failed. Police officers yester­day arrested an 18-year-old suspect in the shooting, and said they wanted to talk with a white woman who was seen with the suspect and the victim. Some of the young women at Aunt Olga's [sic] house yesterday were saying that Danny must have been killed "over that woman." 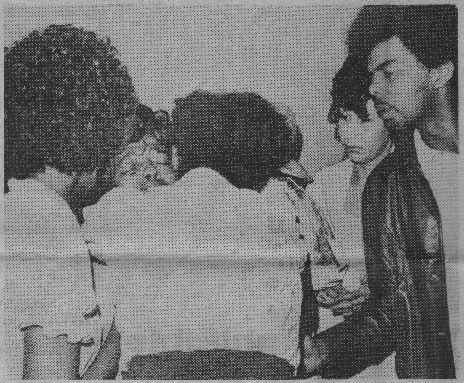 The young men talked bitterly about the suspect. The anger was contagious in Danny's close-knit family, but mostly the talk was just sad, about Danny, the lost brother. Twenty people, maybe more, crowded into Aunt Ola's small living room and adjacent kitchen in her little clapboard house. The "family" extends out to distant cousins and friends who are "like sisters" to Momma Johnson. The rooms hushed as Momma Johnson, steadying her voice, told how she had rushed to the death scene, past oolice lines: to her son's body. "I held his head in my lap. He told me, "Momma, I love you." I told him, 'I love you, too," she said, col­lapsing into tears as Aunt Ola and a friend hugged her. Blood stains were still on Momma Johnson's pants and shoes. Danny should have been dead by the time his mother reached him, but no one doubted she heard those words. The police report said Danny and the possible suspect and a woman went to the death scene, to the apartment of a 36-year-old woman who is a friend of Danny's family, on Saturday afternoon. Danny wished the woman "a Happy Easter" and helped her decorate eggs. After that, Danny went out and apparently argued with the possible suspect. Danny was shot in front of the apartment or in the lobby. He staggered into the basement of the apartment where he died, police said. A spent shot­gun shell was found near the building entrance. A hush fell over Aunt Ola's living room again as Momma Johnson began to tell about her son. "Danny was born Oct. 16, 1958. He lived in Seattle all his life. He was an average child. He got into trouble, but he was never sent up," she said. He hoped to get training as a welder, like Uncle Willie said a brother. He was not in school when he was killed. Little brother Greg Johnson, 15, said Danny was a "cool person, hardly ever bothered anyone." Aunt Ola said if he had been there now, he'd be "wrestlin' with everybody, even me, jokin' around. He was always kiddin'." "He had a beautiful singing voice." said sister Karen Travis, 19. He wanted to sing in a group. "I just loved him," said sister Denise, 20. He was a joker in matching levis jacket and pants, a hip guy with "high hopes," said brother Willie. Police filed Danny's case under No. 76-23447. An autopsy will be conducted today, said the King County Medical Examiner's office. He was killed in census tract 114. The Associated Press chronicled his death with six lines on the local wire. "He wasn't a violent kid," said Uncle Willie Keller. "I got six other kids, but what was taken from me was part of my life, my heart." said Momma Johnson. There are several tie-ins with Jack Gordon in this sad story. The primary one is that Aunt Ola Walsh was the wife of his brother-in-law Richard Walsh. In addition, the location for the "wake" at 2023 Dearborn was the house where Roberta Gordon grew up.